Many people would be ashamed by this story. Lindell tells it all the time. “I was like, ‘Wow, drug dealers care!’ ” he says. 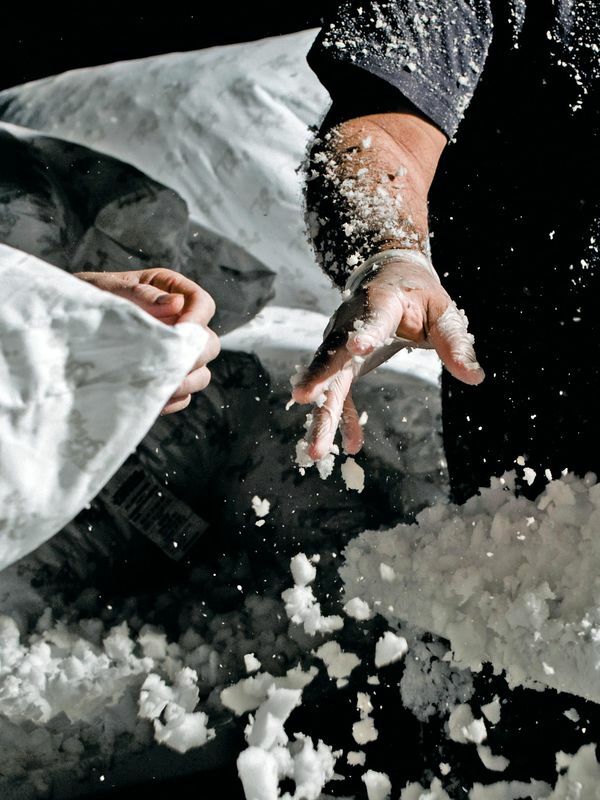 “That’s what it felt like, this incredible intervention.” The moment wasn’t the end of his drug abuse, which started in his 20s when he owned bars and stretched through the early years of MyPillow, the Chaska, Minn., company he founded in 2005 to fulfill his dream of making “the world’s best pillow.” It was, however, his low point. It was when he realized that abusing crack and running a business weren’t compatible in the long term and vowed to get better. He smiles wide, white teeth emerging from under the push-broom mustache familiar to anyone who watches cable TV, and takes out his phone to show me a picture: It’s him, looking wired and wan, like a man who’d been bingeing on drugs for days. Ty took it that night, he says. The story is impossible to confirm; Ty isn’t reachable for comment. But it’s become part of Lindell’s legend, and it will be a pivotal moment in the autobiography he’ll self-publish later this year. He and a friend, actor Stephen Baldwin, plan to turn the book into a movie as part of their new venture, producing inspirational Christian films “that aren’t cheesy,” Lindell says. Eight-plus years later, Lindell is sober and phenomenally successful. He quit everything—alcohol, powdered cocaine, and crack—after one final party on Jan. 16, 2009, and presides over an empire that’s still growing precipitously. Last year he opened a second factory, saw sales rise from $115 million to $280 million, and almost tripled his workforce, to 1,500. To date he’s sold more than 26 million pillows at $45 and up, a huge number of them directly to consumers who call and order by phone after seeing or hearing one of his inescapable TV and radio ads. On this day in early November, he’s just back from a week in New York, spent celebrating the election of Donald Trump, whom he met at a Minneapolis campaign stop and decided to support, whole hog. He’s spent the morning catching up on business with various employees who cycle in and out. People don’t seem to make appointments. They just know the boss is around and stop by the conference room he uses as an office, hoping to get his attention. Lindell laughs loudly. He wears two discreet hearing aids, but everyone says he’s been boisterous forever. “God’s given me a gift to be able to put people in the right position, where their strengths are!” he says. Next, Bob Sohns, his purchasing manager, arrives to ask if Lindell will meet a guy who flew in from Italy to sell him an automated pillow filler. “That’s very close to the truth,” Sohns says. Next, Heather Lueth, Lindell’s oldest daughter, the company’s graphic designer, comes in to talk about the latest e-mail campaigns. MyPillow is, someone at the company told me, more a family forest than a family tree. Lindell’s brother Corey, who invested at one of MyPillow’s lowest points, is now the second-largest shareholder. His job: doing essentially whatever. Today he’s fixing a grandfather clock. Earlier, he hung a flatscreen TV in the lobby shop. Lindell’s niece, Sarah Cronin, is his executive assistant. His brother-in-law, Brian Schmieg, has no title, but is responsible for gathering “concerns” from the factories to present to the boss in regular meetings. Larry Kating, director of manufacturing, calls from the new factory in nearby Shakopee to discuss whether or not to make 30,000 pillows for Costco that the store hasn’t asked for yet. A worker tags pillows in the new factory in Shakopee. Lindell radiates energy, as if he did cocaine for so long that his body is forever trapped in a manic state. He’s friendly, animated, and unselfconscious, with the kind of laugh you’d assign to a cartoon woodsman from Minnesota. He’ll fiddle with whatever’s in front of him, which right now is a framed picture of himself with Mike Pence and Trump at the election night victory party. Pence is stone-faced—he could be his own wax dummy. Trump is being Trump, flashing a thumbs-up and smiling like a guy who practices in the mirror. And Lindell—he looks like someone who can’t believe his luck. The pillow came to him in a dream. This was 2003. Lindell owned a pair of successful bars in Carver County, outside Minneapolis, and enjoyed the lifestyle a bit too much. He was, he says, a “very functional drug user” with four kids and a nice house. He helped with homework, took the family on vacation, and was a decent father and husband, other than the fact that he used cocaine. Throughout his life he’d sought the perfect pillow. He never slept well, and things kept happening to worsen the problem. He got sciatica. He was in a bad car accident. He nearly died while skydiving, after nearly dying while motorcycling on his way to skydiving. (He quit both activities the next day.) He got addicted to cocaine. When he did sleep, it was fitful. “That’s one of the problems with cocaine,” he says, seemingly without irony. One morning, after he woke—or maybe he was still up, he can’t recall—he sat at the kitchen table and wrote “MyPillow” over and over until he’d sketched the rough logo for a product that didn’t exist. When his daughter Lizzie came through to get some water and saw him maniacally scribbling the same words over and over like Jack Nicholson in The Shining, she asked what he was doing. “Dad, that’s really random,” she said, and went to her room. The only way Lindell was ever happy with a pillow was when he found a way to, in his words, “micro-adjust” an existing one. It would typically be foam; he’d yank and pull the filling apart to break up the inside, then arrange and pile up the torn foam like a mouse building a nest, until it was the right height for his neck. Then he’d sleep. By morning, it would be all messed up again. When Lindell imagined his perfect pillow, it was micro-adjustable but would keep its shape all night. He bought every variety of foam and then asked his two sons to sit on the deck of the house with him and tear the foam into different-size pieces that they’d stuff into prototypes for testing. Day after day they did this, until Lindell settled on a mix of three sizes of foam—a pebble, a dime, and a quarter, roughly. When he stuffed just the right amount of that mixture into a case and shmushed it around to the shape he wanted, it held that shape. It was perfect. Sitting on the deck with his sons and ripping the foam by hand wasn’t a scalable model. He needed a machine to do the tearing. He tried everything, including a wood chipper. 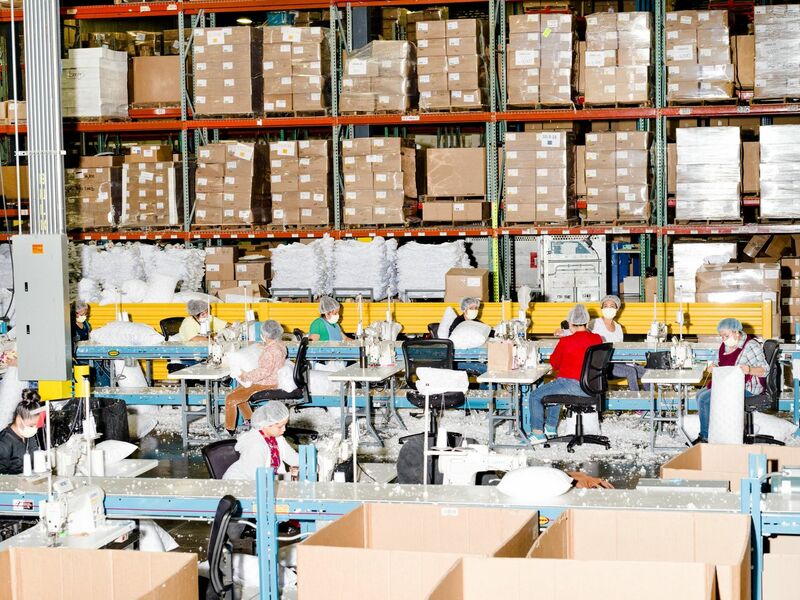 Workers sewing up pillows at the factory. A friend who grew up on a farm suggested a hammermill, an old-timey machine that’s used to grind corn into feed. Lindell couldn’t find one anywhere. Word got around, and an old cribbage buddy called to say he’d spotted a rusty hammermill sitting in a field about a mile from Lindell’s house. Lindell picked it up, rebuilt it as best he could, and sure enough, it worked. Lindell believed this pillow “would change lives.” He made 300 and went in search of buyers, stopping at every big-box retailer in the area. “I said, ‘I have the best pillow ever made. How many would you like?’ ” You can imagine how that went. When someone suggested he try a mall kiosk, Lindell borrowed $12,000 to rent one at Eden Prairie Center for six weeks, starting in the middle of November 2004. He sold his first pillow the first day and it was, he says, “the most amazing feeling.” But he’d priced the product too low. His cost was more than the retail price. Plus, his pillow was too big for standard pillowcases. The kiosk failed. He borrowed more money against the house, and also from friends who weren’t sick of him yet. When desperate, he counted cards at the blackjack table to pay for materials. He was good at it. Eventually, all the casinos within a day’s drive banned him. His focus on the pillow project was the one thing that could override his drug cravings, but only for short periods. And every time something went wrong, he lapsed. This enthusiastic buyer ran the Minneapolis Home + Garden Show, one of the largest for home products in the country. He wanted Lindell to have a booth. Lindell took 300 pillows (this time they were a standard size) and sold them all. He also got himself invited to take a spot at the Minnesota State Fair and sold well. This was a revelation. There were dozens of home and garden shows around the country and countless more fairs. “Those are your testing grounds,” he says. A product that works at the fair works, period. For the next few years, this is basically how the company operated. Lindell and a few key salespeople drove around in trucks stuffed full of pillows to sell at fairs. They were all effective, but no one’s pitch—sermon was more like it—moved the merch like Lindell’s. Days after getting clean, Lindell borrowed $30,000 from the owners of a mulching company and used that to repair relationships with his foam supplier and sewing company. Then he set out to reestablish his primacy on the show circuit, where competitors had been selling MyPillow knockoffs. The big break was an interview in the Minneapolis Star Tribune that ran in the business section in early January 2011. The morning the story hit, MyPillow’s web traffic went crazy. In a single day, the company made more sales than it had in the previous six months. The surge lasted three months. He’d never considered that a newspaper could have such impact. He began designing and placing ads that looked like shorter versions of that original story, right down to the goofy picture of him hugging a pillow. They worked. His story of insomnia, of being unable to find a pillow that fit him specifically, seemed to resonate. Lindell had another hunch: He knew the best way to sell his pillow was to present his story live, as he’d been doing at shows since 2005. He decided to make an infomercial. His friends thought he was nuts. In August 2011 he booked a space in downtown St. Paul with a studio audience. His producer wrote a script, and at the read-through they all agreed it was bad. He sounded stiff. Instead, the producer suggested, he should just talk to the hired host as if they were having a conversation—sell her the pillow the way he sold it at fairs. “He had no credit and wanted $1 million in goods,” recalls the supplier, Leon Brocas. He’s still not sure why, but Lindell was so passionate that “we decided to give him a shot,” Brocas says. Lindell walks through the factory. The half-hour infomercial aired for the first time on Oct. 7, 2011, at 3 a.m. on the East Coast. The business “went straight up,” Lindell says. He hired everyone he could find—literally off bar stools sometimes—and put them to work answering phones or sewing on machines that he stuffed into every corner of a local bus garage lent to him by a friend. And he kept spending. He bought every long-form infomercial spot he could find and actually ran out of available slots before running out of money to pay for them. In six months, he grew from 50 to 500 employees and sold almost $100 million in pillows. But Lindell never bothered to figure out his indirect costs. He didn’t really even know what those were. Checks were flying off his desk, more and more of them to pay for the infomercial spots, with no way to know which ones were working and which were just wasted money. But at this point he wasn’t sure who his customers were, so it was hard to know which spots to cut. Federal Foam was concerned enough that Smith dispatched his chief financial officer to see what was going on at Lindell’s bus garage. It took him almost no time to see that, despite propulsive growth, MyPillow’s costs were out of control. Lindell was losing $250,000 a week. On a day in November 2014, right before the midterm elections, Lindell was shivering on a tree stand while deer hunting. He was a little down—he’d just gone through a second divorce, and, because he’d taken his eye off the ball, the company was in a sales slump. Suddenly, the phone app that provides real-time sales graphs spiked. He phoned his call center to see what happened. It was a short ad that had just begun to air on Fox News. He shot a deer, then ran to his car and called his media buyer to ask how much Fox he could buy through the end of the year. The answer was $2.1 million. Buy it all, Lindell said. The ads coincided perfectly with the Republican takeover of Congress, branded as a retaking of America. And here was Mike Lindell, a humble American success story, making pillows in American factories. By 2015, MyPillow was growing faster than ever. In January 2016, Lindell announced to his board that he’d had another dream: MyPillow was going to become a billion-dollar company. “I didn’t know the date then,” he says, stepping out of his blue Dodge Ram pickup with green accent stripes outside the loading dock of his new 100,000-square-foot factory. After his nocturnal vision, he’d instructed his manufacturing team to find this location and begin building it out in anticipation of tripling sales. It opened in May. Workers stuff pillows by hand. Inside, two lines make pillows at a rate of 12 per minute (37,000 per day). They start with a modern version of that original hacked-together hammermill and end with several brand-new machines to automate functions that were, just a few months ago, done by hand. For instance, one assembles boxes; another stuffs two pillows into a plastic bag and seals it (two-for-one being MyPillow’s typical sale). “These are all machines Darren ordered,” Lindell says, striding through the factory. Darren is his son—he helped his dad tear up foam out on the deck. Now he runs this facility. Walking through the factory, Lindell shows off his newest products: a dog bed and a mattress topper. Then he points out a section of the building where returns are handled. Fewer than 3 percent of MyPillow buyers return products, he says, and “less than 1/20th of 1 percent of those return a product twice.” Lindell obsesses over customer satisfaction. If a customer is on hold for more than a few minutes, he gets an alert on his phone. He expects customer e-mails to be answered within minutes, and if a queue builds up, he gets an alert about that, too. He often handles hundreds of minutes of calls per month himself. For years, MyPillow was advertised as the cure for almost every sleep problem as well as many health ailments. Ads boasted that using one could alleviate fibromyalgia, joint pain, and restless leg syndrome, as well as promote delta sleep, the most restorative phase of the sleep cycle. Early last fall, Lindell settled with 10 California district attorneys who sued MyPillow for false advertising, arguing that these claims had no scientific backing. The company denied any wrongdoing but agreed to pay $1 million to settle and to remove those claims from any advertising in California. Lindell actually pulled the claims from all advertising to avoid future suits. The new factory could run faster and soon will, Lindell says. MyPillow could push production up to more than 85,000 pillows a day. To get there, he says, all he needs to do is buy more media. He says that what he calls the “tsunami”—the next boom in sales, the one that will lead to $1 billion—started last fall. The election was just another harbinger. Two women who did merchandising for the Trump campaign have stopped by for a tour and have been tailing our group. They seem in awe of the scale and efficiency here, from an essentially flat and somewhat chaotic-seeming organization ruled by a single outlandish man. What’s the largest sales month you’ve ever had? one asks. “MyPillow is always the biggest we’ve ever been on the day you’re standing here,” Lindell replies.